A large group gathered outside the Barry County Jail to honor the memory of fallen officer Master Sergeant Carl Cosper, Jr. as his number, BCSO #76 was officially retired. Above, Barry County Sheriff Gary Davis presents a duplicate copy of the memorial for Master Sergeant Carl Cosper, Jr. that hangs in the Sheriff’s Office with Cosper’s widow, Angela. 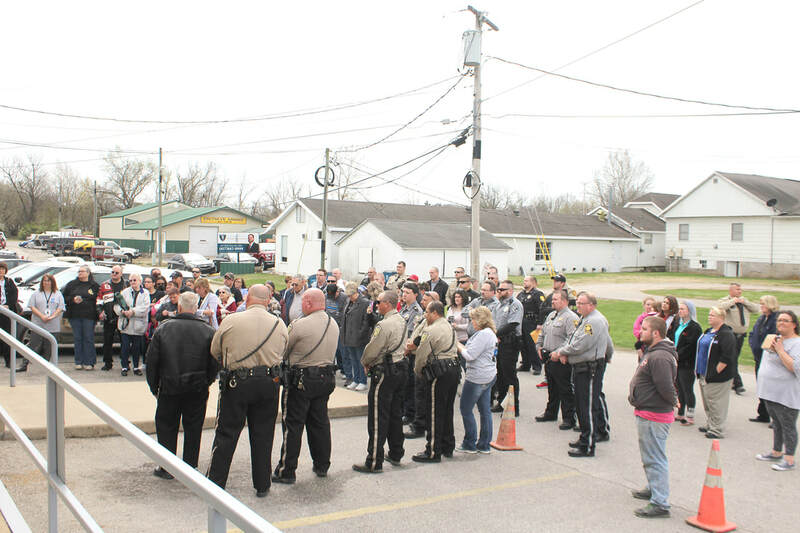 On Friday, around 75 people gathered outside the Barry County Jail as Sheriff Gary Davis officially retired the number of Master Sergeant Carl Cosper, Jr. Cosper’s number 76 was retired after he was killed in a car crash while on duty last year. Sheriff Davis went on to explain the Missing Man’s Table set up on the steps of the jail and read a proclamation from the Barry County Commission, retiring Cosper’s badge number. The table is a somber reminder of an officer or veteran who lost his life in the line of duty or was taken as a prisoner of war. Davis read the proclamation aloud to the crowd: “Some men are called to give a little in performing their duties, some give a lot, and some give everything. Master Sergeant Carl T. Cosper gave everything. “On April 7, 2017, while performing his duties as a Deputy Sheriff of Barry County, Master Sergeant Cosper was killed in the line of duty in an automobile accident. “He began his career in law enforcement in 1994 where he worked several years at the McDonald County Sheriff’s Department. He worked for the Barry County Sheriff’s Office for 10 years and obtained the rank of Master Sergeant. He accepted the risks that were part of his duties. They are risks that every law enforcement officer deals with on a daily basis as he goes about doing his job. He died protecting the public that he served from a violent criminal act. Master Sergeant Cosper earned our respect and our gratitude. Sheriff Davis then called Carl’s widow, Angela Cosper, up from the audience to present her with a memorial, the duplicate of which will hang in the Barry County Sheriff’s office. A tearful Cosper, accepted the memorial from Davis. Davis then said, “Angela is, as you might imagine, at a loss for words. I know she says thank you. I know Carl’s family says thank you. I want to thank all of the officers, the ladies and gentlemen of Barry County and surrounding counties, for their support in the last year. It was one of the roughest things I had to do in my law enforcement career and most of you, too. Following the presentation of the memorial plaque, the sheriff’s office administrative staff led the crowd next door to the park where the group gathered and released blue and black balloons in memory of Cosper. They also handed out memorial cards with small blue “ribbons” that when planted, grow flowers.